LAS VEGAS, Aug. 1, 2017 /PRNewswire-USNewswire/ -- (Sept. 12–13, 2017) — Results from 20 clinical trials featuring the most recent research, procedures and devices in vascular Interventional technology and treatment will be released on Tuesday and Wednesday, Sept. 12 and 13 at the annual VIVA Conference. 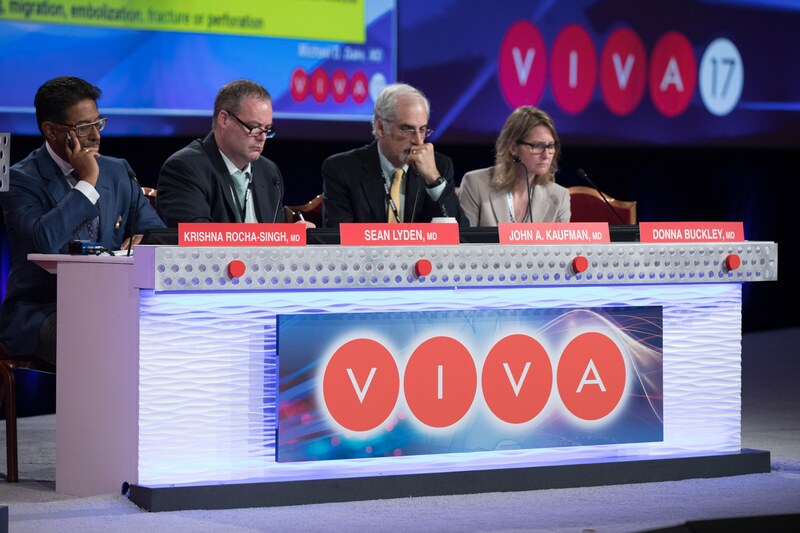 The conference, to be held at the Wynn Las Vegas and presented by VIVA Physicians, also features presentations by a multi-specialty faculty along with live case presentations from clinical centers all around the world. Attendees will include interventional cardiologists, interventional radiologists, vascular surgeons and medical device development specialists from multiple nations. Presentations of the late-breaking-trial-embargoed results will be made in the Global Theater and highlighted during press conferences. Media outlets are invited to attend the press conferences in person and presentations, either in person or remotely via Virtual VIVA, a live-streaming link. To view the detailed schedule and register to attend, visit the VIVA 17 Virtual Press Room. A Unique Bioconvertible Inferior Vena Cava Filter: 1-Year Results from the SENTRY Trial, Michael Dake, M.D. Two-Year Results from the IN.PACT Global Study, Thomas Zeller, M.D. Insights from the Zilver PTX Study in Japan, Michael Dake, M.D. Primary Patency of the BioMimics 3D Helical Stent: Significant Outcome from the Mimics Study, Thomas Zeller, M.D. Four-Year Results of the IN.PACT SFA Trial: Drug-Coated Balloon Catheter vs. an Uncoated Balloon Catheter in Femoropopliteal Lesions, John Laird, M.D. DANCE Trial: Two-year Outcomes from the 157-Limb Atherectomy Cohort, George Adams, M.D. 24-month Results of Acotec Drug-Coated Balloon Catheter: Randomized, Multicenter, Controlled Clinical Study in Femoro-popliteal Arteries (AcoArt I), Wei Guo, M.D. Safety and Efficacy of a Novel Percutaneous Bypass Procedure for Long-Segment Femoropopliteal: A Sub-Analysis from the DETOUR I Trial, Sean Lyden, M.D. Clinical Outcomes Among Vascular Procedure Patients Receiving Suture-Mediated vs. Surgical Cutdown for Closure of Large Bore Arterial Access, Darren Schneider, M.D. Interim 18-months results of the AV trial: A Randomized Trial of Drug Coated Balloons in Hemodialysis Arteriovenous Fistulae, Gregory Nadolsky, M.D. Comparison of Particulate Embolization after Femoral Artery Treatment with IN.PACT Admiral, Ranger and Stellarex Paclitaxel-Coated Balloons in Healthy Swine, Aloke Finn, M.D. CAS Benefit: Subgroup Analysis of ACT 1, Gary Ansel, M.D. MarrOwStim PAD Kit for the Treatment of Critical Limb Ischemia in Subjects with Severe Peripheral Arterial Disease: 24-Month Results from the MOBILE Trial, John Laird, M.D. ILLUMENATE European Randomized Trial: Two-Year Results, Marianne Brodmann, M.D. Five-year EVAR Outcomes Are Equivalent Between Genders: Results from the ENGAGE Registry, Mark Schermerhorn, M.D. First Prospective Multi-center Study Evaluating Outcome Following EVAR in Women vs. Men: Early results from the LUCY Study, Jennifer Ash, M.D. Results of PREVEIL, DCB Feasibility Study, Gary Ansel, M.D. The PRELUDE Study: Prospective Study for the Treatment of Atherosclerotic Lesions in the Superficial Femoral and/or Popliteal Arteries Using the Serranator Device, Peter Schneider, M.D. Use of a Paclitaxel-Coated Balloon to Treat Obstructive Lesions in the Superficial Femoral and Popliteal Arteries: Preliminary Results from the SAFE-DCB Trial, Edward Woo, M.D. First-in-Human Experience with Endovascular Aneurysm Repair Using the Ovation Alto Stent Graft, Sean Lyden, M.D.